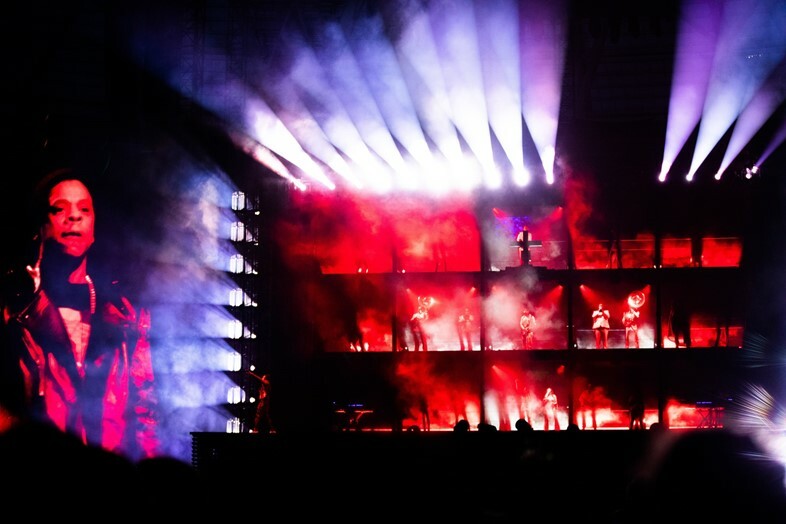 The show was brought to life by Stufish, a London-based entertainment architectural firm who also worked on the stage that was used for Beychella (as well as having a storied history producing shows for Lady Gaga, Queen, and U2). 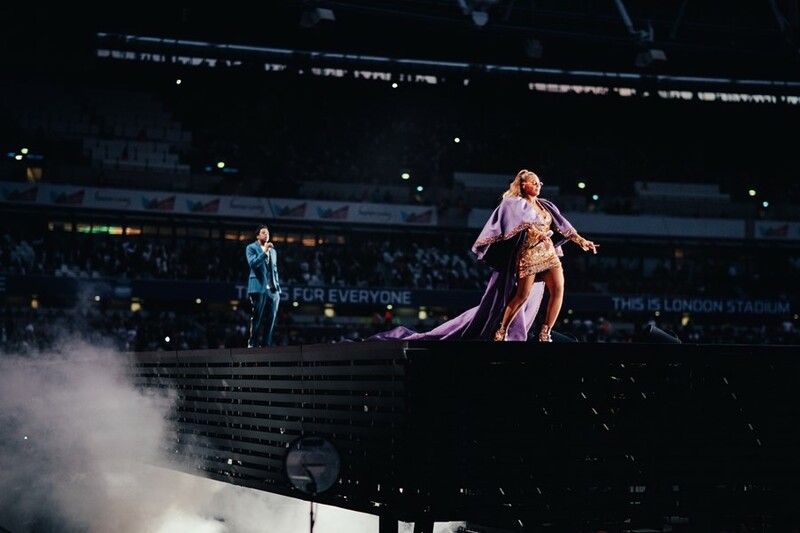 Dazed spoke to Stufish architect Ric Lipson about how the stage design reflected Beyoncé and Jay-Z’s narrative of forgiveness and reconciliation, why Beyoncé altered the design to accommodate a huge band, and how the show may change as it keeps travelling. How did Stufish first come to design the stage for Beychella? Ric Lipson: They approached us in probably October last year. For Coachella, she wanted to be on some kind of pyramid, with lots of performers. It evolved and evolved, and it became clear that it was about (about) the HBCU experience in America, about this cheerleading, dancing, marching band vibe. That was around November last year, we met with Beyoncé, and presented the Coachella design. She was very happy and thought it was probably possible to put out in the 40 minutes (we had after) the previous act – (it was) very, very ambitious, but we managed to pull it off. We spent February to April rehearsing with Coachella. And at the same time we were designing the stadium show. What was the brief or concept they gave you for the stadium show? Ric Lipson: It was this story of a couple that is in love, but who become separated, and they spend part of the show ringing round each other and then they find their way back to each other, and they are reunited. So the conceptual idea for the stadium show was this idea of two catwalks that would be extending deep into the audience, much further than most shows. Because stadiums are such a big place, it’s a vast, vast space to try and fill, and video screens sort of do that to a point, but there's nothing like going even further out – the ability to get the artist off the ground is magical. They wanted a very big video screen. But unlike any other artists, who were happy with just the video screen, this video screen had to (open to reveal) the orchestra, and this real human, sculptural element. In Coachella we had 120 performers – this series of productions has been about people's bodies and musicians and talent and energy, rather than just a video screen. We wanted to capture something similar on the tour, but we couldn't take 120 people with us. And so (we created) this four-storey structure on stage, which the video screen splits (to reveal). Conceptually, what it's (also) about is that this people live on the run, on the roads, and the division has been about that – they are separate. So you are living in a continually moving world, of hotel rooms, towers, lots of stairways and lifts that take you all over the place, conceptually. So we wanted this idea of a lot of movement. As the show evolves, and we get through to the darker stage of the show, where she gets into singing songs from Lemonade, he's singing songs from 4:44, the apology album to the anger album, so they step out and the bridge (between the catwalks) lifts up and tracks over the audience. That space becomes a magical, psychedelic, euphoric space for the people underneath. And the final part of the show is just celebration, the greatest hits. How much did the design change throughout the process, and how involved were Bey and Jay? Ric Lipson: They're very involved with most decisions. Some decisions are made because of artistic reasons, some decisions are made because of budgetary reasons, some decisions are made because you have to pack it up into trucks every day and take to the next city. Beyoncé was very clear that she learned a lot of things on the Formation tour. Things worked well on the video screens, and things didn't work well. What she absolutely felt was that you didn't always want a video background, because you get lost in the ability to do anything or you don't know what to do on it. Whereas the minute you have people there and energy and real physicality, it's very individual and something no one else has done. So she's continually pushed for (the four-storey structure), which was something that came at a big expense and delayed the fabrication. It was the right thing to do, because when that wall opens up and you see that band and they're such amazing musicians and they have swagger and individuality, all those people of all shapes and sizes rocking out, it's just a very brilliant visual in a time where the world is so digital. To actually see 27 real people playing real music, it's a wonder. Most shows want to make all that noise with four people. But Beyoncé wants more people, to make it real. We wanted the whole show to be a blend of art installation, meets an opera, meets a concert, meets a dance piece, meets architecture. We wanted it to feel much cleaner and different to a more traditional pop concert. I think the show at times is absolutely a pop concert, at other times it’s very simple and artistic. They're trying to continually redefine the genre and how you do this. That's really the narrative for what they are and what they do, and our job is to help portray that. How do you physicalise their references and their emotions? Will the show change now as it keeps travelling? Obviously they have a new album out and will probably be performing new material now – will there be new staging? Ric Lipson: The show will change, for sure. There'll be new content, and they will use the stage differently in those new songs. I don't think they're going to redo the whole show, because there are a lot of hits that you want to sing and there's only nine songs on the album. I don't know yet. We actually rehearsed some bits but we never put them in the show. We're on hand if there's other plots that evolve over the next few weeks. I don't imagine they'll change the main set, because once you're on the road it's really hard to make major changes. But you never know. What's beautiful about making a show is that they're an evolving organism. You as the designer, it's like having a child. You give birth to the child but you don't necessarily know how it's going to be raised. We give birth to these children and we raise them for a few weeks, and then we put them up for adoption and they grow up with a different family. Beyoncé and Jay-Z seem like good adoptive parents to have. Ric Lipson: Exactly. I wouldn't mind giving my children up to them.